Every St. Patrick’s Day I fall prey to the temptation to make corned beef and cabbage and, no matter how carefully I pick the corned beef, eyeing it for evidence of fat, I am always queasy afterwards, because no matter how many times I drain the boiling liquid, corned beef and cabbage just isn’t kind to me. So this year I decided no corned beef boiling in the kitchen. I bought a small package of deli corned beef – the kind where 2 slices = 2.5 grams of fat – and had a corned beef sandwich for lunch. But I still had purchased the cabbage, because they are at a very good price around St. Patrick’s Day. I wanted to make something a little different. Now my dear mother used to make wonderful stuffed cabbage, sweet and sour and beef-filled. And I plan to make it one day with buffalo to show you all the recipe she was famous for and which was one of my favorite childhood foods. But this is not mother’s stuffed cabbage. 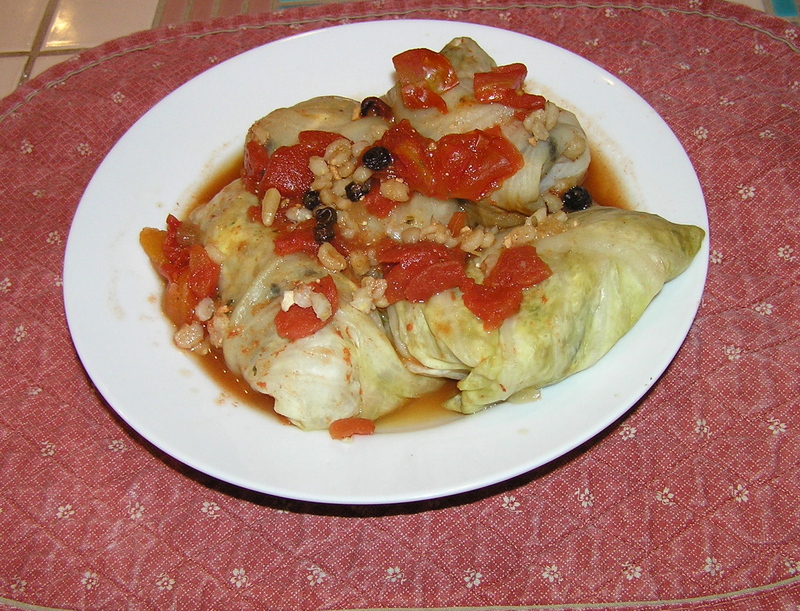 It is a very tasty vegetarian stuffed cabbage that originally came from Cooking Light. Strangely, once I cooked it, it had some of the same flavor as my mother’s cabbage rolls, although the ingredients are quite different. Steam cabbage head 8 minutes; cool slightly. (See note below.) 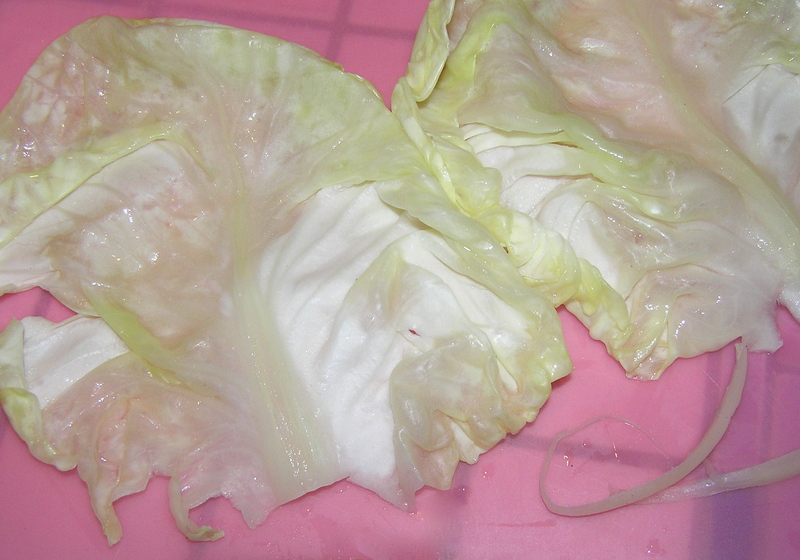 Remove 16 outer leaves from cabbage head; use remaining cabbage for another purpose. Cut off raised portion of the center vein of each cabbage leaf (do not cut out vein, you want the leaf whole); set trimmed cabbage leaves aside. 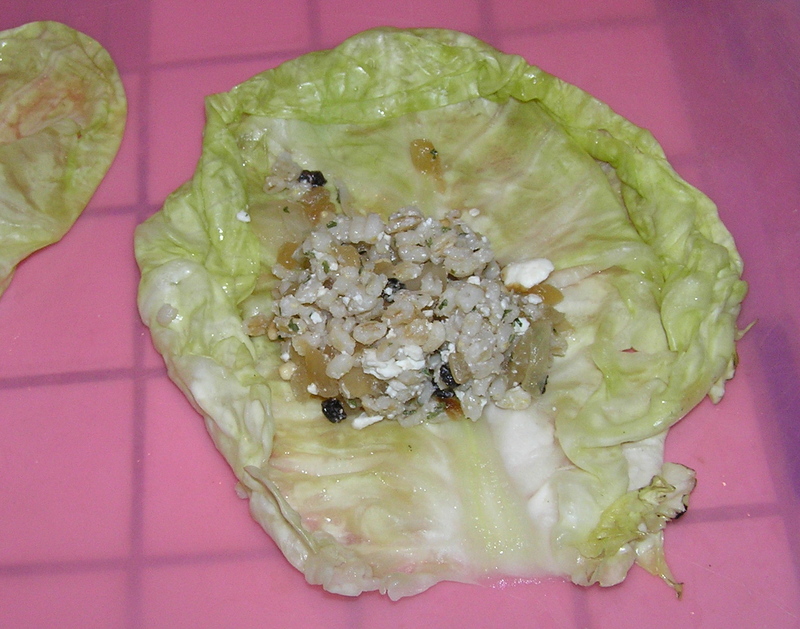 Place cabbage leaves on a flat surface; spoon about 1/3 cup barley mixture into center of each cabbage leaf. Fold in edges of leaves over barley mixture and roll up. Arrange cabbage rolls in the bottom of a 5-quart electric slow cooker. In a medium bowl, combine the remaining 1/4 teaspoon salt, remaining 1/8 teaspoon pepper, apple juice, vinegar, and tomatoes; pour evenly over cabbage rolls. Cover and cook on high 2 hours or until thoroughly heated. Makes 4 servings (4 rolls are one serving) at 6 grams of fat/serving. I actually could have made at least six more rolls with the filling, so either I was not stuffing them enough, or my leaves weren’t big enough. I took the extra filling for lunch. Also, I used a can of diced tomatoes because that was what I had in the house – but crushed tomatoes (or diced tomatoes that were chopped in the food processor) would have made a smoother sauce. NOTE: I did not like this way of separating the cabbage leaves. The outside leaves were soft enough, but as you got to the inside, they were harder and thus more difficult to fill and roll. I suppose you could stick the cabbage back in the steamer for a bit after you reached the harder leaves. 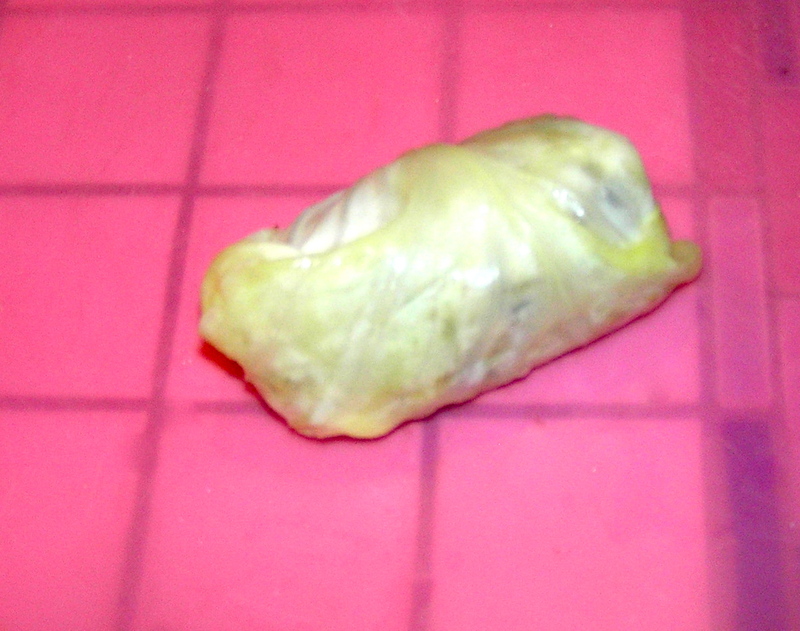 My mother didn’t have a steamer, so she immersed the cabbage in boiling water for a bit, then took it out and sliced off the soft leaves at the bottom (she didn’t core it). Then she put the cabbage back in the boiling water and repeated until she had all the leaves she needed. This seemed to produce more, softer leaves. The weather people have been hyperventilating about the season’s first snow. Oh, I just can’t wait! Especially after last year. And then I woke up this morning and it was snowing vigorously! Mind you, it was only about a quarter of an inch, but it was still hanging around ominously when I get home this evening. I have been wanting to make this dish for some time. I had the ingredients in my refrigerator, but somehow it always got too late when I came home from work to start chopping cabbage and trimming pork tenderloin. I usually eat a bit later, but 10 p.m. is a little late to sit down with a substantial dinner dish. Then I got a useful idea sparked by a memory of visiting China many years ago. I noticed that instead of buying prepared foods, people were stopping on their way home from work to buy fresh cut-up vegetables. The shops displayed various combinations of chopped vegetables in their windows. I suppose these were combinations that could be made into popular dishes. A person could buy these chopped fresh vegetables, pick up a small bit of meat, and go home to make a quick home-cooked meal that had their own spices and flavorings. How practical. So I trimmed and cut up the pork and chopped up the cabbage and green onions the night before, putting them in separate bags in the refrigerator. Ready to go when I got home the next day. The preparation of this dish is quick once you get through the chopping, which actually didn’t take all that long. It is one of those dishes where it is best to prepare all the ingredients in advance, so that you can add them quickly at the proper point as you cook. I combined the pork with the garlic since they were added at the same time, and had all the other ingredients mixed and at the ready. I warn you that this dish is quite hot – great for a chilly day with %#$!# snow on the ground You are adding two sources of heat: white pepper which is actually very hot and Sriracha sauce wihich is even hotter. I was a bit fearful of adding a tablespoon of Sriracha, a hot chile sauce, because I had a traumatic experience with Sriracha once, where I added too much and ruined an entire pot of chili. But I plunged ahead, and it was hot, but not inedible. Also, I don’t really see how this was sour at all. There was no sour element like lemon juice involved. It was quite tasty – and hot. Combine pork, 1 teaspoon cornstarch, white pepper, and 1/4 teaspoon salt in a medium bowl; set aside. (Whisk the dry ingredients well before you add the pork so you don’t get a piece of pork with a high concentration of white pepper, says the voice of experience) Put minced garlic in same bowl as pork, but don’t mix it in. Combine remaining 2 teaspoons cornstarch and 1 tablespoon water in a small bowl; set aside. Combine ketchup and next 3 ingredients (through soy sauce) in a small bowl; set aside. Heat oil in a large nonstick skillet over medium-high heat. Add pork mixture and garlic; sauté 2 minutes or until pork is no longer pink on the outside. Remove pork from pan; set aside. Add cabbage; sauté 2 minutes. Here is the point where the cooking became a bit frenetic. I cooked this (as I cook almost everything that isn’t soup) in a large flat-bottomed wok. Two pounds of chopped cabbage came to the very top of the wok. The heat was on medium high and I was stir-frying like mad trying to keep the bottom pieces from burning. The cabbage was not cooking down, and pieces kept leaping out of the pan as I stirred. I was going to take a picture of the cabbage, but I was frantically trying to keep the flying cabbage pieces from landing in the flame below and setting the whole kitchen on fire. I finally added 2 tablespoons of water and stirred mightily. This had the salutary effect of loosening the browned bits of pork and garlic from the bottom of the pan and creating steam to soften the cabbage. I heartily recommend this procedure. Crisis averted and house fire prevented, I continued on with the recipe. Add ketchup mixture; sauté 2 minutes. Stir in pork; sauté about 1 minute. Stir in cornstarch mixture; cook 30 seconds or until a bit thicker. Remove pan from heat; stir in onions. This made four tummy-warming servings at about 8 grams of fat/serving. At first, I didn’t even make rice for it to go over. I ate it with a fat slice of French bread to sop up the juice. The original recipe was from Cooking Light, and although the Sriracha sauce hinted at Asian origins, this did not seem to have that flavor orientation. Later, when talking to a friend, she thought that cabbage, pork, hot and sour sounded Russian, or at least Eastern European, so next time I served it over noodles. This is part two of my experiments with the home-made ranch dressing. I thought that cole slaw would be handy to have around. It’s a good side dish, and I like to put it on sandwiches instead of lettuce. Now that the weather has warmed up a bit (relative to 9 feet of snow), I took out the smoker and smoked pork tenderloins. The cole slaw was particularly tasty on smoked pork loin sandwiches. What appears to define cole slaw dressings is cider vinegar and sugar to give it the familiar sweet and sour tang. So I just added the vinegar and sugar to the ranch dressing. Whisk the first 4 ingredients together in a large bowl. Add cole slaw mix and toss thoroughly. This is even better the next day. Makes 8 servings, with less than a gram of fat/serving. Variation: After a day or so, I got bored with plain cole slaw, and decided to dress it up to make it a more interesting side dish. I added a 15 ounce can of pineapple tidbits (drained) and ½ cup of golden raisins to half of the slaw. I let it sit in the refrigerator for several hours so the raisins would plump. This would be a nice salad to take to a potluck, since the flavors are a little surprising. It still has less than a gram of fat/serving. When I was growing up, borscht was this red soup made from beets that came in a bottle. You poured it in a bowl, plopped some sour cream in the middle, and ate. But recently I discovered that there is a whole different kind of borscht, which is a sweet and sour cabbage soup. It tastes like my mother’s stuffed cabbage, one of the favorite foods of my youth, which she only made for special occasions. Actually, I remember liking the cabbage and the sauce better than the filling. 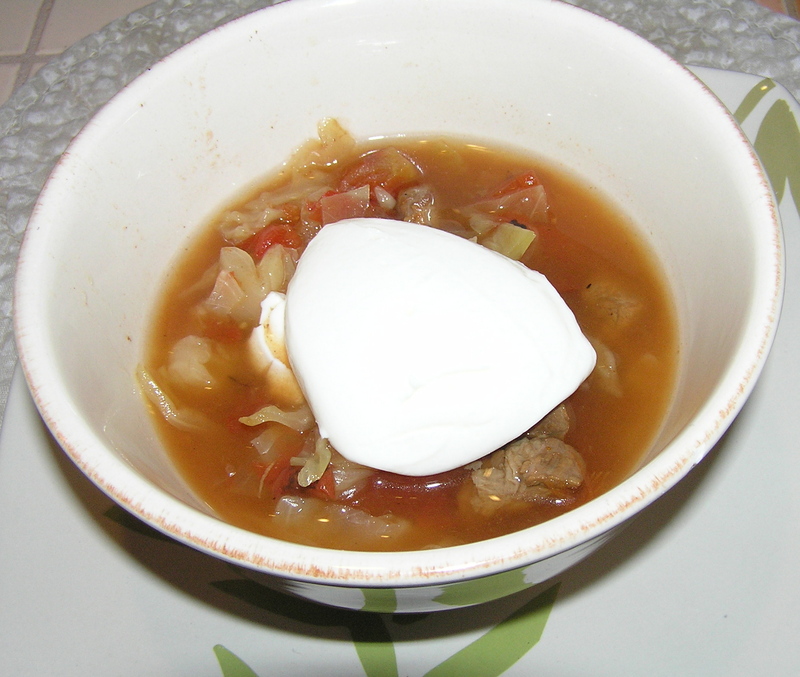 To make borscht, you cook meat to make a broth, then add the other ingredients. The meat typically was flanken, a cut of beef (short ribs) that appears to consist of bone, gristle, and fat, Clearly, this had to be updated. So get out the soup pot. 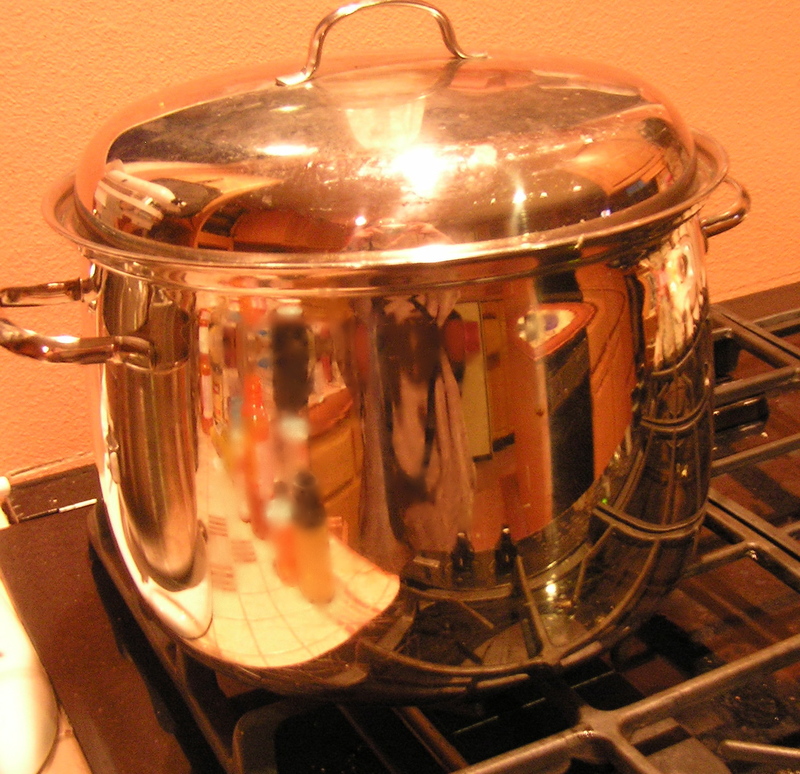 Spray the bottom of the soup pot with cooking spray. Brown the buffalo pieces, stirring occasionally. Be sure they get nice and brown to make a rich broth. When the meat is browned, add the 2 quarts of water. Stir so that all the browned bits on the bottom are mixed in the broth. Add the onion. Cover and bring to a boil. Lower the heat and simmer for 2 hours, stirring once or twice. Stir in the tomatoes, lemon juice, brown sugar, and salt. Allow to simmer while you shred the cabbage. I cut the cabbage in eighths lengthwise, and then cut it in half inch slices across. Taste the soup and adjust the seasonings to your own sense of sweet and sourness. You’ll probably have to adjust it again after the cabbage cooks. Add the cabbage and stir well. Simmer for another 2 hours, stirring occasionally. Adjust seasonings (lemon juice, brown sugar, and salt) at the end of the cooking. I usually put soup in the refrigerator overnight to remove the fat, but when I did, there was absolutely no fat on the soup surface. It is hard to estimate the number of servings for this soup – it makes a lot. I estimate a 2 cup serving to be 2 grams of fat. Serve hot (it reheats very well) And yes, you can plop a dollop of fat free sour cream on it. Variation: Some people add diced carrots, celery, or even beets to this. I don’t. I like my cabbage straight up.